~Jo's Scrap Shack~: Personal Challenge- Valentines & A Giveaway! Personal Challenge- Valentines & A Giveaway! Hello friends! I hope you had a wonderful weekend. My weekend was busy as it was my daughter's bowling party and slumber party. Boy was it noisey!!! LOL But the girls all had a wonderful time and I got some beautiful photos for future layouts. Today I am posting weeks 2 and 3 of my personal challenge with my friend Kellie. I did not have the chance to get last week's challenge posted so here it is. Kellie challenged us to use the wax paper resist technique. I did that using some glossy white cardstock by Georgia Pacific and inked it up using Ruby Red ink by Stampin Up. I am not sure if Ruby Red is still available as I had this one for awhile. My sentiment is from Mary's Cardz Tv stamp set called "Hugs and Kisses". 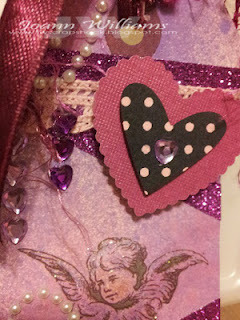 I added some trim from my stash, some gorgeous seam binding ribbon and cut out my hearts using the My Favorite Things "Hearts A Plenty" die-namics. I used some of the Martha Stewart glitter bits on the white heart. I love those! Ok so on to week 3's challenge... I challenged Kellie and I to create a nice Valentine tag. Here is what I came up with. 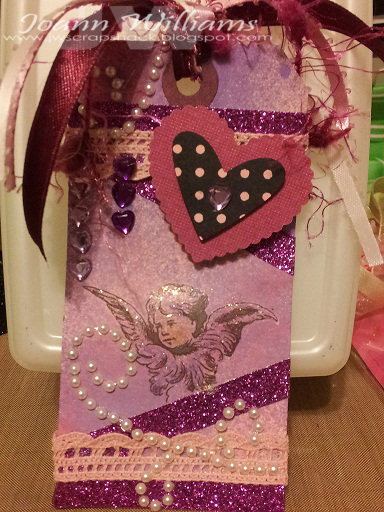 I used a shipping tag and sprayed it with my "Star Fish" red and "Fully Purple" glimmer mists by Tattered Angels. Once that dried I added some glitter tape by American Crafts, some heart bling from Recollections, pearl bling by Want 2 Scrap and a cute angel rub-on by Fancy Pants. 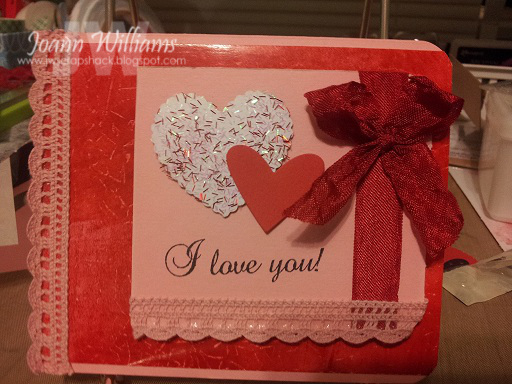 Again I used my MFT Die-namics to cut out the hearts and used a polka dot stamp to stamp the smaller heart. I added some trim that I had left over from the card above and finished it off with some fibers and ribbon. Here is a closer look at the tag. Now it's time for my giveaway! 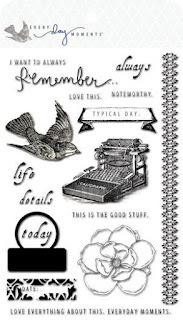 One lucky person will win this stamp set from Theresa Collins. It's called "Every day Moments" and I just adore this set. All you have to do to win is stop on over to Kellie's blog, become a follower and leave her some love and then leave me a comment below that you did so! That's it! Easy Peasy! I will announce the winner on Friday the 15th. Well I surely hope we have inspired you to get creative and if you would like to do the challenges with us, we would love to see your creations! Have a wonderful day and thanks for stopping by!!! Your card and your tag are wonderful!! I love all the embellies on the tag!! The giveaway parcel arrived yesterday. Thank you so much!! I look forward to creating with all the goodies! Thanks again! !